The Scottish Fingerprint Service has made a last minute attempt to rush though a redundancy deal with officers involved in the Shirley McKie case. BBC Scotland has learned that a "detailed" offer has been made to the officers in the last fortnight. It comes just days ahead of the publication of a parliamentary inquiry into the affair. The former Strathclyde Police officer was cleared of leaving a print at a murder scene in 1997. Ms McKie, from Troon, in Ayrshire, received an out-of-court settlement of £750,000 after being found not guilty of committing perjury, when she contested the opinion of experts from the Scottish Fingerprint Service. However, the officers have continued to insist that they did not make a mistake. Since the inquiry was set up to examine the procedures and actions which resulted in Ms McKie's compensation claim, the six experts have been carrying out restricted duties. They were first offered a deal to leave their jobs in September last year and have now been approached with a new offer. Labour MSP Ken MacIntosh, who represents three of the officers, said: "I think the attitude of the SCRO to these officers is disgraceful. "What they are trying to do is push these officers out of the door rather than try to get to the bottom of what is a very difficult case. "The idea that these decent, hardworking, professional and honest people should be scapegoated for the failings of others is absolutely ridiculous." Pauline McNeil MSP, who is chairing the inquiry, has also expressed concern that the report should be used to rush through a settlement in the dispute between the officers and the fingerprint service. 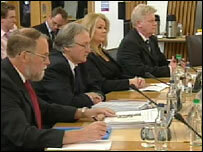 David Mulhern, chief executive of the Scottish Police Services Authority, refused to make a detailed comment. However he said: "Like any responsible employer, we have an ongoing dialogue with our staff. Everyone has a right to confidentiality in personnel matters and we take that right seriously."